The Vivoactive HR GPS Smartwatch from Garmin features Elevate™ wrist heart rate technology, tracks your activity throughout the day, counts steps taken and calories burned, and features smart notifications including call, text, email and social media alerts to keep you connected at all times. Designed with a smart black silicone sports strap. Garmin Vivoactive HR GPS Black Smartwatch Size Regular is rated 3.0 out of 5 by 4. Rated 1 out of 5 by Anonymous from No this watch is Crap My review is that this watch is terrible, you cannot read the watch face as it is not bright enough, the heart rate monitor is way out. And at night you cannot read the time due to the fact that there is know back light that is at night, during the day you have to get yourself in real light to read the watch face. So in answer to your question no i would not recommend this watch to anyone Garmin should get there act together and put a light inside this watch to make is bright and readable. Rated 5 out of 5 by Anonymous from I bought this for the Golf app which works very well. 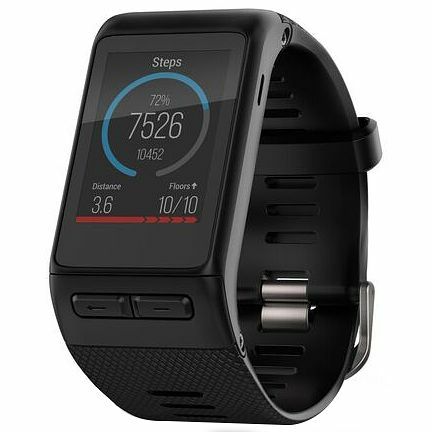 There are many many more apps and I probably won’t use most of them but all in all a great watch I bought this for the Golf app which works very well. There are many many more apps and I probably won’t use most of them but all in all a great watch.